Acknowledged as a major influence on Pixar's WALL-E and Duncan Jones' Moon, and directed by Douglas Trumbull, the special effects genius behind 2001: A Space Odyssey, Close Encounters of the Third Kind, Blade Runner, and, most recently, The Tree of Life. 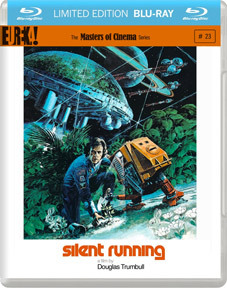 To celebrate the film's 40th anniversary, Silent Running will be released on UK Blu-ray by Eureka as part of the Masters of Cinema series on 14 November 2011 at the RRP of £19.99. The release will also be available as a Limited Edition Blu-ray Steelbook at the RRP of £29.99. The release will boast a new high-definition transfer of the film in its original aspect ratio and, we are tantalisingly assured, a host of extras to be announced nearer to the release date. We're salivating already. As ever, the release will also include a lavish booklet featuring rare production imagery, and more. A lot more, knowing MoC.